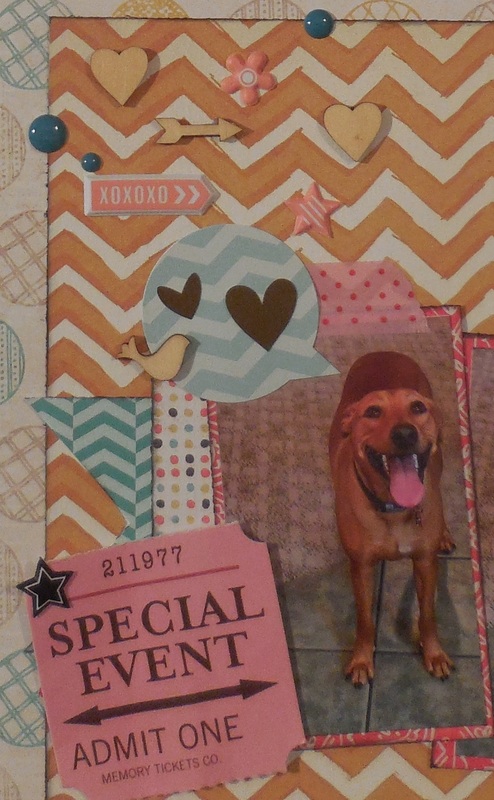 This next layout features a friend’s dog, River. When we first moved into our home last year, we had somebody visiting us each weekend, at least, so they could see the place. And that included doggies! My friend wanted to get her dog to socialize with others, and my 3 are pretty friendly. Isn’t she gorgeous? Just look at that sweet doggie smile! 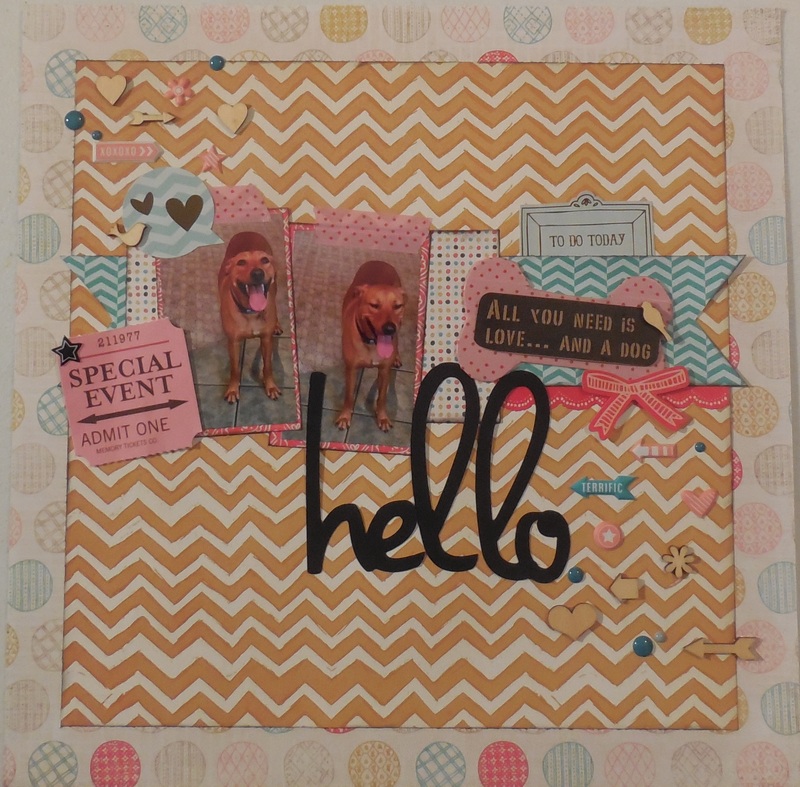 This layout is for ACOT’s Washi Challenge – to use washi tape to cover raw chipboard. I do not have very much “raw” chipboard, but I did find this medium size bone! So I covered it up with American Crafts washi tape. 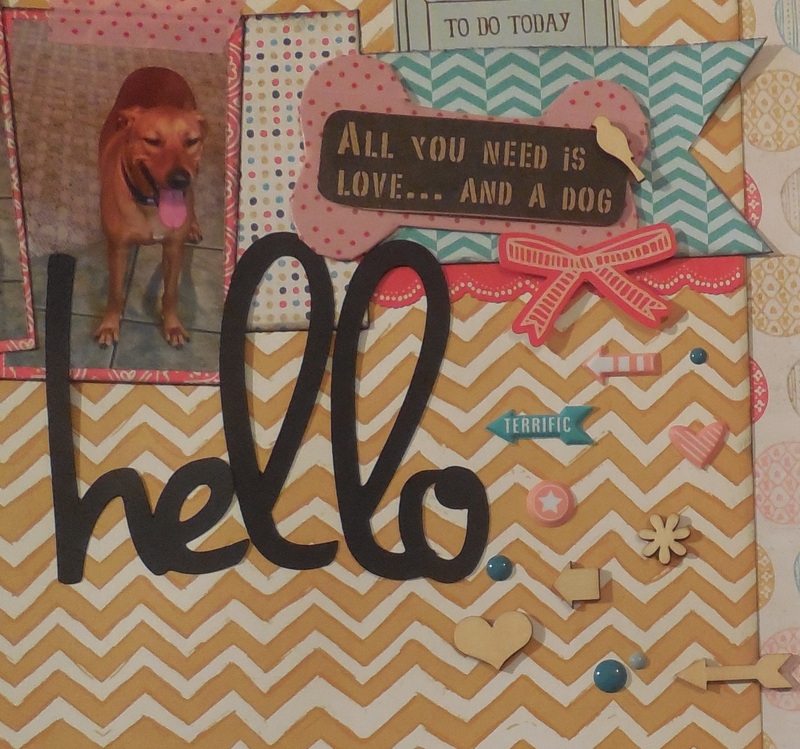 To add interest, I fussy cut the phrase “All you need is love…and a dog” from a sheet of Canvas Corp Kraft pattern paper. The pattern papers (except the chevrons) are by Basic Grey “Paper Cottage”, which is part of my April Use It or Lose It Challenge (along with the Canvas Corp paper). I used a few stickers from the sticker sheet too (To Do Today tag; bow; border strip). 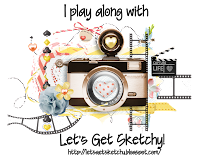 The puffy stickers and special event tag are also from my April Challenge. The teal pattern paper, word bubble and enamel dots are Echo Park; with veneers from CTMH (as well as puffies). And with that said, all I have left from the Basic Grey “Paper Cottage” Collection are the alphas and half of the sticker sheet. But the paper is GONE!